Today the faith community we call home, made a bold political statement. We agreed to center our existence in this politically and economically charged culture of America upon the love that is God. And, we put it in writing, signed it, and will deliver to the President (whoever that may be), and to some of the other powers that be. 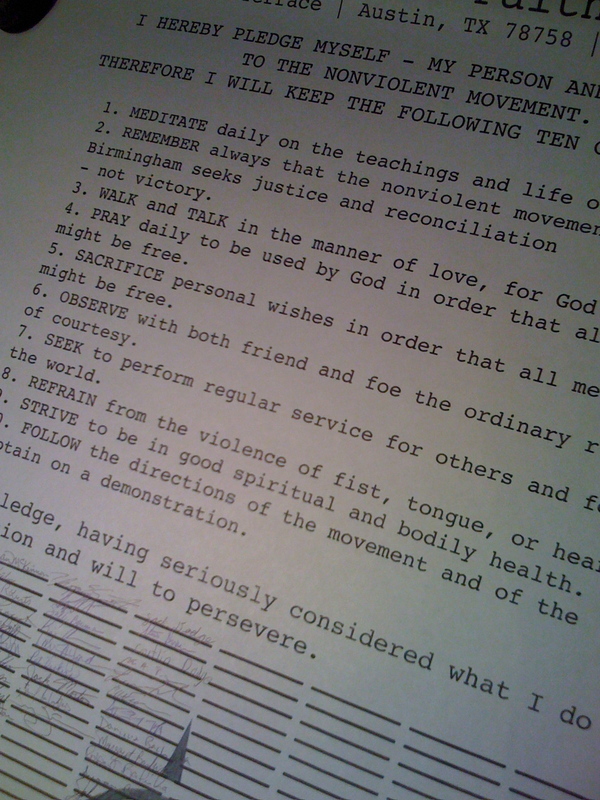 Today, we finished our journey through the 10 commandments of the pledge that student protesters agreed to abide in Birmingham, AL in 1963, and we decided to not only proclaim our statement for love, we decided to sign it and deliver it. 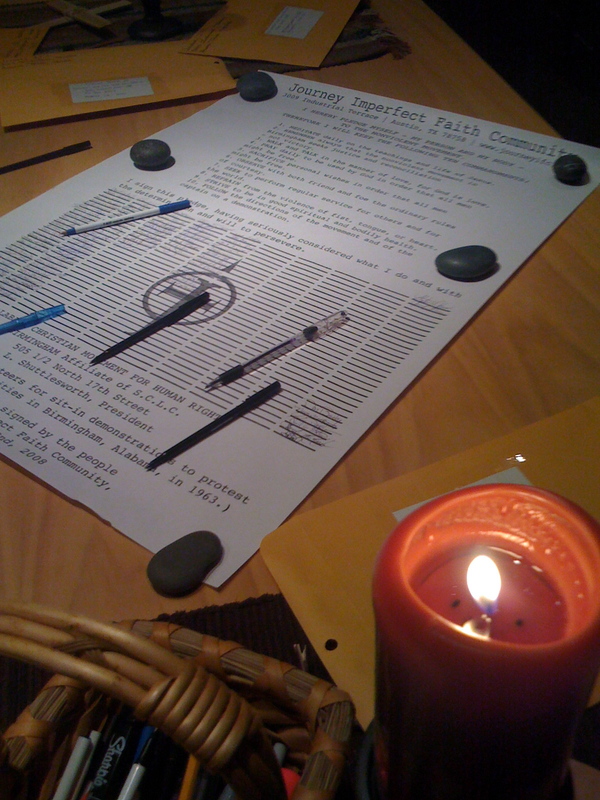 We have decided as a community of faith to resist the temptations of fear and greed. Instead we have chosen to make a political statement that does not succumb to fear, greed, nor power. Instead we have chose to make a political statement that does profess God’s love is at the center of who we proclaim to be and the goal we will continue to seek. While others viewed nonviolence as only one of the alternatives, for Martin Luther King, Jr., it was “only road to freedom.” In September 1948 while a student at Crozer Theological: Seminary, he heard Dr. A.J. Muste and Dr. Mordecai W. Johnson preach of the life and teaching of Mahatma Gandhi, the leader of Indian independence. Since his entrance at Crozer, Martin had begun a serious quest for a way to eliminate economic and social evil. One year later, Dr. King became involved in a crisis in which the philosophy of nonviolent resistance could be applied. On December 1, 1955, Mrs. Rosa Parks, a 42-year-old seamstress was arrested because she refused to give her bus seat to a white man. When the Black people of Montgomery decided that it was “more honorable to walk the streets in dignity than to ride the buses in humiliation,” they called on Dr. King to be their spokesman and leader of the newly formed Montgomery Improvement Association (MIA). 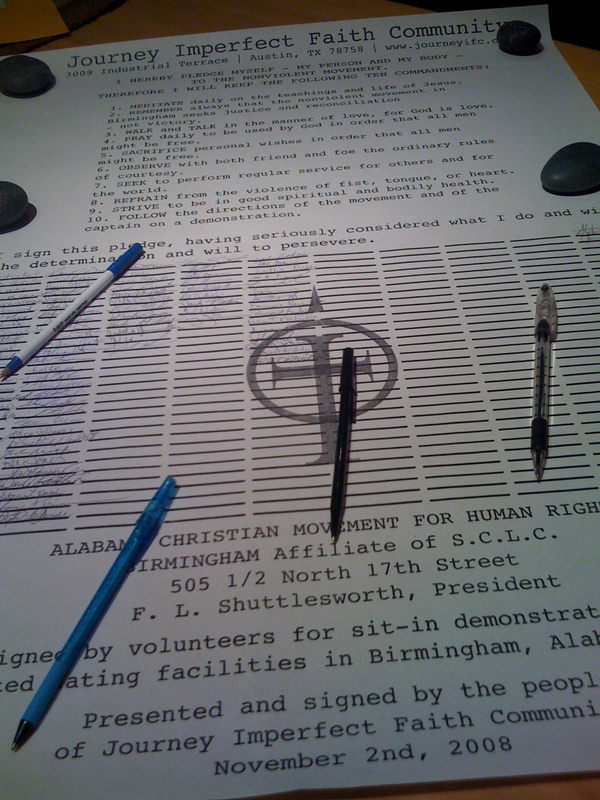 The association began a nonviolent boycott of Montgomery’s transit system. 1. MEDITATE daily on the teachings and life of Jesus. 2. REMEMBER always that the nonviolent movement in Birmingham seeks justice and reconciliation—not victory. 3. WALK AND TALK in the manner of love, for God is love. 4. PRAY daily to be used by God in order that all men might be free. 5. SACRIFICE personal wishes in order that all men might be free. 6. OBSERVE with both friend and for the ordinary rules of courtesy. 7. SEEK to perform regular service for others and for the world. 8. REFRAIN from the violence of fist, tongue, or heart. 9. STRIVE to be in good spiritual and bodily health. 10. FOLLOW the directions of the movement and of the captain on a demonstration. I sign this pledge, having seriously considered what I do and with the determination and will to persevere. Run errands, Drive my car, Fix food for volunteers, Clerical work, Make phone calls, Answer phones, Mimeograph, Type, Print signs, Distribute leaflets. Today, we seek to become part of this satyagraha, this “truth force” that proclaims at its core, our existence is due to love, and this creator of love is an unstoppable force.